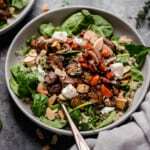 Balsamic vinegar, garlic, toasted almonds and goat cheese maximize roasted veggie flavors in this warm Balsamic Roasted Vegetable and Quinoa Salad. 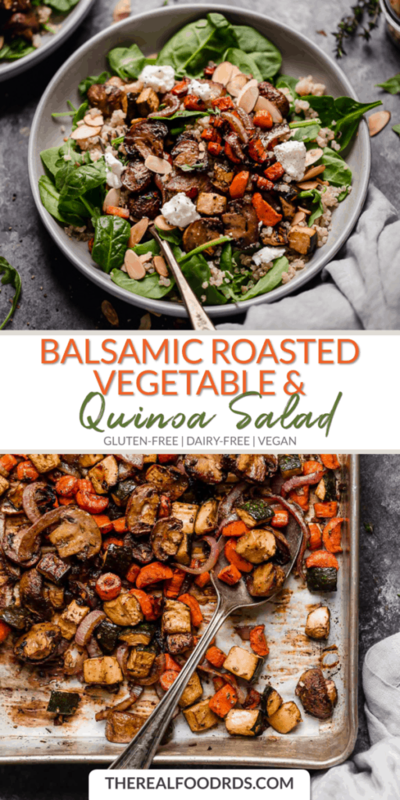 This warm Balsamic Roasted Vegetable and Quinoa Salad is a perfect side dish for a weeknight dinner or could even make a beautiful addition to a special occasion meal. It pairs ever so nicely with chicken, beef, pork, and fish or because of it’s heartiness, and it can be served as a satisfying plant-based meal. Leftovers can be enjoyed warm or cold. But first…a little rant on why all foods fit. If you found us through the Whole30, you may be thinking, what the heck?! I thought they didn’t eat grains or that they only share Whole30 and Paleo recipes. Well, I’m here to tell you that we believe all foods fit. Yes, even treats and goodies and things that come out of packages. Now we understand that the Whole30 (or any diet program for that matter) has a time and a place, but as we all know, it’s not a forever thing. I know the buzz word, balance, is overused and unfortunately has kind of lost its meaning, BUT it truly is all about balance. Period. Eat mostly (keyword…mostly) whole, real foods in a well-balanced manner. Eat your veggies (and fruits, too). Avoid diet labeling. Why add stress to your life by forcing yourself to stick to one specific diet? It’s not worth it and we believe that it isn’t necessary to achieve optimal wellness to feel, look and be your best. Phew! This topic has been weighing heavy on my heart, so thank you for letting me get that off of my chest. Be on the lookout for a blog post that will expand more on this topic. So anywho, real food is food in its most natural form. Real food includes quality proteins from both animal- and plant-based sources, whole grains, bean and legumes, all the veggies and fruits, healthy oils and organic (preferably full-fat) dairy. Quinoa most definitely fits into the “real food” umbrella. You can download our Real Food List here. So let’s give a little shoutout to quinoa. A fabulous grain for many reasons. It’s a complete source of protein which is rare in the world of grains. This means that it contains all of the amino acids necessary for our nutritional needs. It’s especially great for those that consume a diet free of animal sourced foods. It’s high in iron and calcium, and is a good source of manganese, magnesium and copper. It’s a good source of fiber. It’s versatile in that it can be used in both sweet and savory cooking. We have several recipes on our blog that include quinoa including: Quinoa Spinach Turkey Burgers, Tex-Mex Quinoa Salad with Black Beans and Corn, Pepperoni Pizza Quinoa Bake, Southwest Quinoa Bake, and Roasted Brussels Sprouts Quinoa Salad. 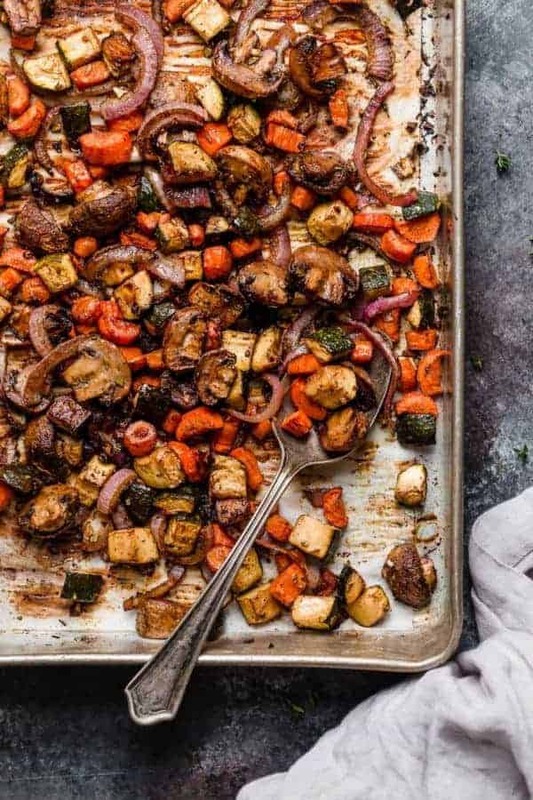 Roasted vegetables are always a good choice. I was just talking to Jess the other day about how I LOVE roasted veggies. They are truly one of my most favorite foods. I love the sweetness that the roasting brings out in them and when they get the slightly crisp edges. Adding different herbs and spices is a fun way to mix up the flavors. Also, the possibilities are truly endless with the countless number of different vegetables that are perfect for roasting. 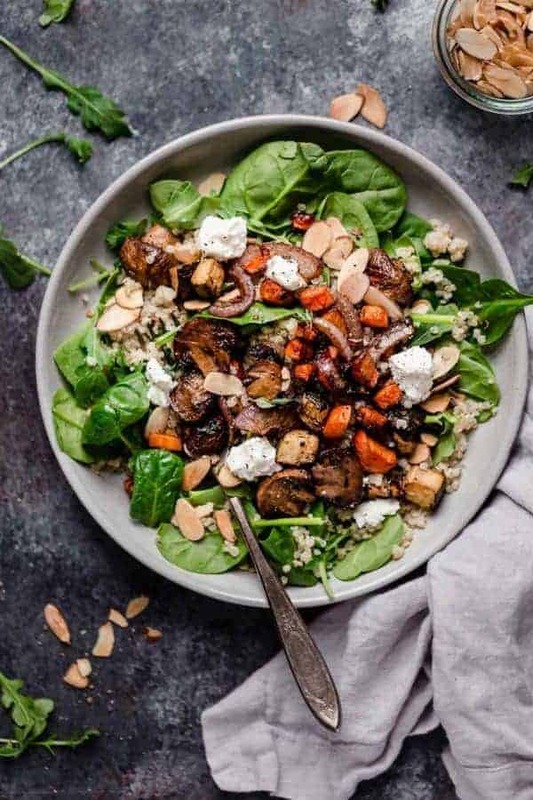 This Balsamic Roasted Vegetable and Quinoa Salad has it all. The hearty quinoa, the perfectly roasted veggies, and the flavor from the balsamic vinegar and garlic. Feel free to mix up the vegetables in this recipe based on what you have on hand or what sounds best to you. I’m thinking I’ll add some Brussels next time. 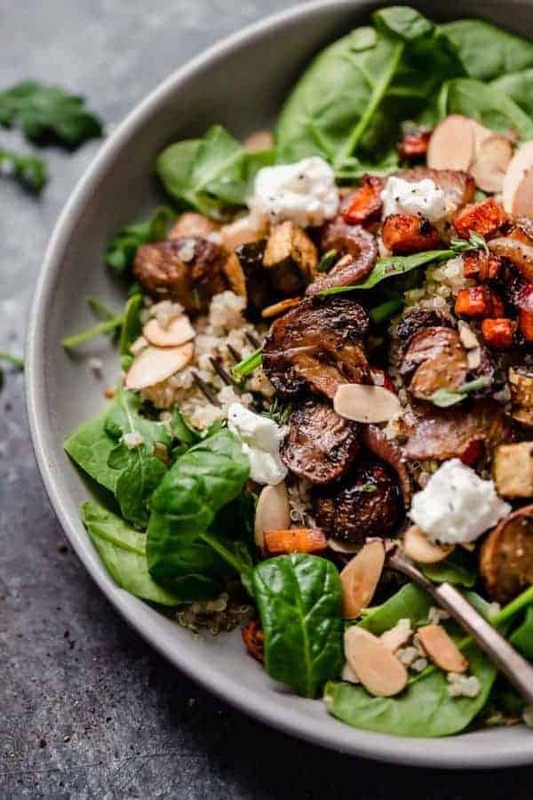 Take this Balsamic Roasted Vegetable and Quinoa Salad to the next level with goat cheese! Totally optional, but totally delicious, adding soft goat cheese to this salad is indescribably delicious. When added to the warm salad the goat cheese gets a little melty and all of the flavors mesh to make one hell of a scrumptious fork full. Who says healthy eating has to be boring? For those of you reading this that think healthy eating is boring, allow me to prove you wrong with this recipe. 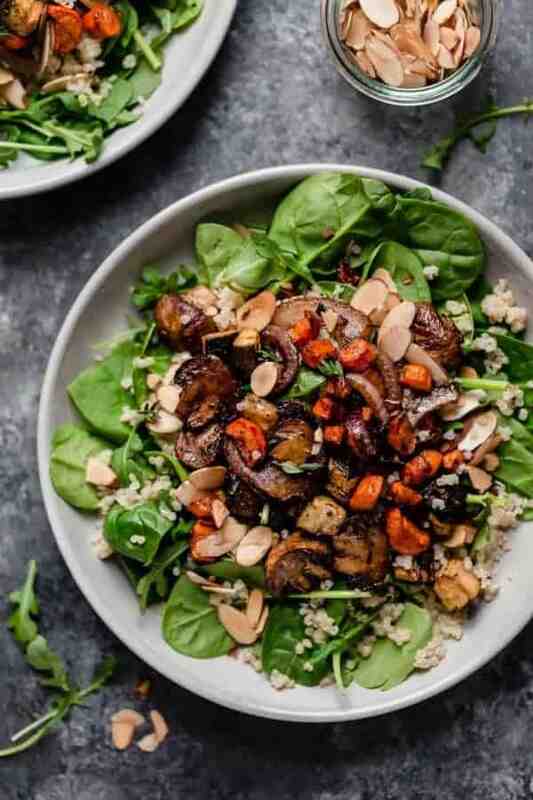 Serve Balsamic Roasted Vegetable and Quinoa Salad over a bed of greens with some toasted almonds on top. My favorite way to serve this salad is over a bed of greens. I’m a big fan of the arugula and spinach mix from Earthbound Farms. More veg for the win! Then, top the salad with some toasted almonds to add a little crunch. Seriously, this salad is just the best! 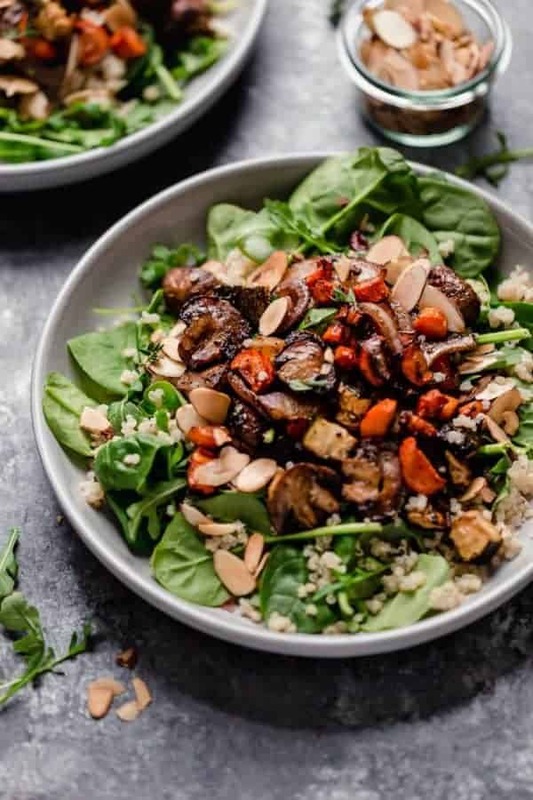 As I stated above, feel free to serve this salad with your favorite quality protein such as chicken, steak, pork or fish or enjoy it as a tasty and satisfying plant-based meal. Also, don’t forget that leftovers are great served warm or cold. Have I ever mentioned I love leftovers? 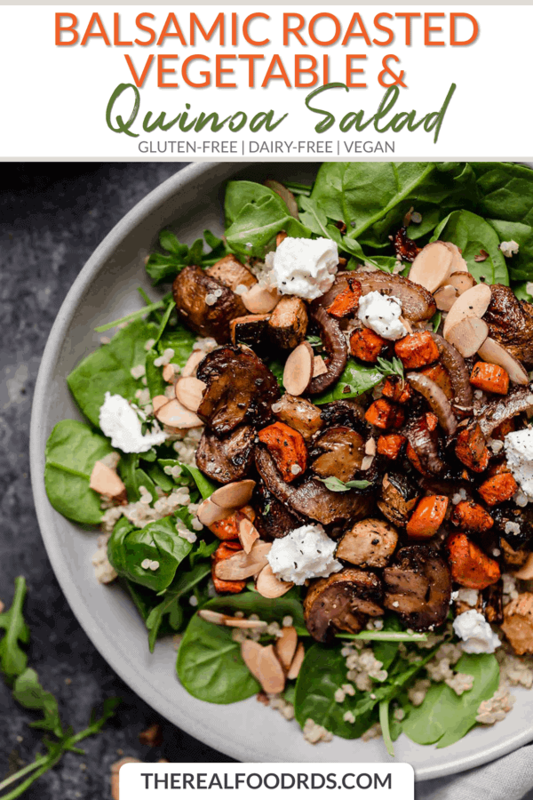 A beautiful and tasty salad that makes for a perfect weeknight dinner when serve with your favorite quality protein such as chicken, steak, pork or fish or you can enjoy it as a tasty and satisfying plant-based meal. Leftovers make for a perfect next day’s lunch, served warm or cold. 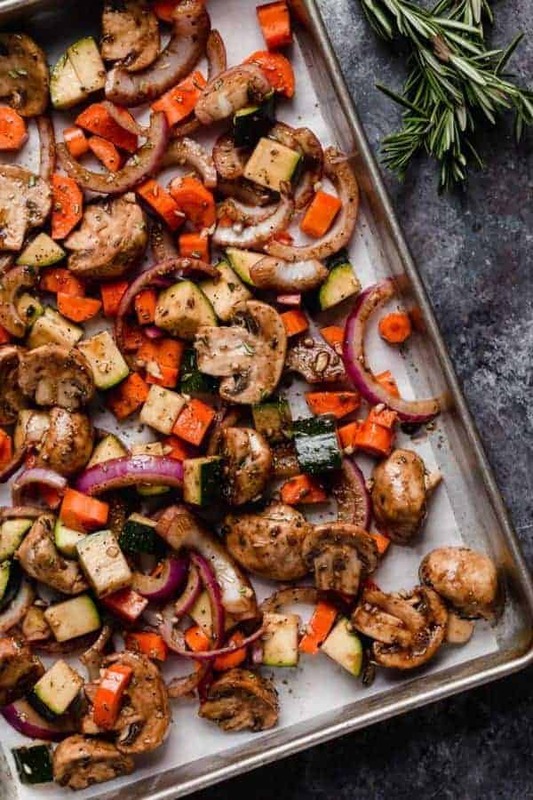 Place the chopped vegetables and garlic on a baking sheet. Add rosemary, salt and pepper and toss with olive oil and vinegar so that vegetables are evenly coated. Place vegetables in oven and bake for 18-20 minutes or until carrots are tender, tossing halfway through the baking time. Meanwhile, combine water and rinsed quinoa in small sauce pan. Bring to boil then reduce heat, cover and cook for 15 minutes. 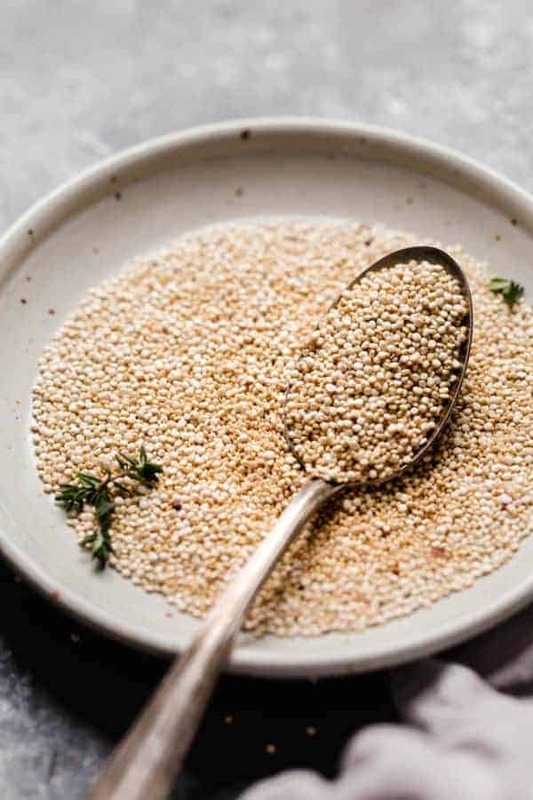 Once quinoa is cooked, fluff with a fork then place in a large serving dish. Add roasted vegetables to quinoa and toss to combine OR serve roasted veggies right on top of quinoa. Optional: Add a bed of greens such as arugula to a serving bowl, and serve salad over greens. Top with almonds and goat cheese. Serve warm or chilled. We hope that you love this quinoa salad recipe! Comment below and let us know if you give it a try. Love this recipe! I substituted pine nuts for almonds and it was very yummy! I especially like the ratio of veggies to quinoa. It’s really a veggie dish with just a bit of the quinoa seed for texture. And with the protein from the goat cheese I ate it solo for lunch. So great to hear Ginger! Thank you for the feedback and we’re so glad you loved it! This recipe was super quick, super easy, and most imprtantly, SUPER tasty!!! I added some chicken with mine and loved it! Equally as tasty for leftovers! Awesome! So glad you loved it — it’s definitely one of our faves as well. i just tried this, and it is absolutely delicious!! !will be making it again and again!! I think I have tried almost all of them. Great work keep doing what you doing 😊. Thank you so much for all of your support – we’re thrilled to hear that our work is helping to make your life easier. This looks absolutely delicious! I am quite new to your site, but have really enjoyed your recipes so far. THANK YOU for mentioning balance. I have been trying to figure out what this looks like in my diet, and whether I need to be on Paleo permanently for health reasons. In the past I have been an all or nothing type of girl, which doesn’t help when you LOVE cheese and chocolate. I think taking the time to find out what your body does and doesn’t like instead of just cutting out everything that COULD harm you, is a really important step though, so I am going through the paces. Thank you so much for your kind words. I speak for both Stacie and myself that taking the time to figure out which foods work best for you (and don’t work for you) is crucial whether that’s with a Whole30, Paleo, an elimination diet protocol, testing, etc. Ultimately the goal is to create a style of eating that best suits your individual needs while allowing for the most varied array of foods possible – while feeling your best and maintaining good health. We’ve walked this road ourselves (and continue to do so) so it’s our goal to share recipes that offer choices and don’t fit into one particular label. Another home run Stacie. I make a similar dish, but can’t wait to try it with goat cheese. Why did I not think of that? I use the veggies I have on hand, but need to try it with the quinoa. Love getting your posts! This looks AMAZING! I can’t wait to try it, but more than that I love your message that ‘everything fits’! I can’t tell you how discouraged I get because as a society we’re so determined to label everything (vegan, paleo, etc). I can’t wait to try more of your recipes and start enjoying cooking again! Thank you!! Thanks, Heather! We can’t agree more. Though we label our recipes according to the type of diet they can fit into, we firmly believe that there is no one perfect diet and that you have to do what works best for you individually. Happy cooking! Recipe looks delicious but I have recently joined WW and need to know the saturated fat to calculate point values. Can you help? Hi Cindy! There is 1 g per serving of saturated fat.